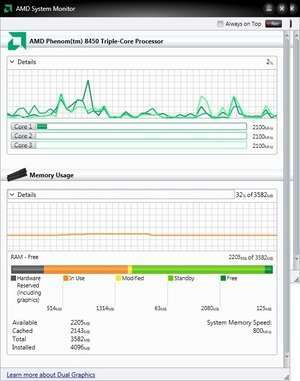 AMD System Monitor is an official tool for processors created by Advanced Micro Systems (AMD). It can display some useful and important information about your installed AMD processor. After the application has been installed, AMD System Monitor provides details about different processor cores, memory installed, fan speed and other advanced details such as the technology supported by the processor. The interface of AMD System Monitor is pretty stylish and provides an easy way to gather details about system resources. Version 1.0.9 is a freeware program which does not have restrictions and it's free so it doesn't cost anything. For security reasons, you should also check out the AMD System Monitor download at LO4D.com which includes virus and malware tests. Additional screenshots of this application download may be available, too.